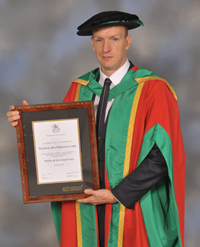 Honorary Degree of Doctor of the University (DUniv) in recognition of his outstanding achievements as a paralympic and world champion and an inspiring ambassador for sport. As a world record-holder in the full and half marathon for athletes with a double amputation, Richard Whitehead might have added a corresponding Paralympic title, but there was no category at London 2012 in those events for leg amputees. Undeterred, he switched to sprinting and won Gold in the 200m T42 event with a world record time. Born in Lowdham, Nottinghamshire, Richard used to teach swimming at Clifton Leisure Centre in Nottingham, and has also played ice sledge hockey, representing the GB team in the 2006 Turin Winter Paralympics. His talents and determination are an enduring inspiration to able-bodied and disabled athletes alike, from local to international level. In 2013 he was made an MBE and completed a sensational 40 marathons in 40 days from John O’Groats to Land’s End, raising funds for the charities Sarcoma UK and Scope.